Everyone knows how much toddlers love to get mucky. So why not allow them to indulge their favourite pastime, while encouraging them to be creative at the same time? Body painting - not painting your body but painting with your body - is a great way for little ones to explore their sense of self, and have fun while they're at it. And when it's sunny outside, there's no better time to let them get as creative – and as messy - as they want. 1) Have your children strip down into underwear, nappies or swimming costumes. 2) Spread out large pieces of card, butcher paper or paper rolls on the ground in an area that can get completely covered in paint. 3) Let them squirt or rub paint over themselves – if they are babies you will have to do this for them. 4) Allow them to go wild! They can roll around on the paper, finger paint, kick their feet on it – whatever takes their fancy. The goal is to be as creative and uninhibited as possible and make fantastic colourful prints using their entire body. 5) Take plenty of pictures! Body paints these days wash off easily and are completely non-toxic. Make sure you purchase the correct type of paints before you go wild (see Make Your Own Body Paint, below). Outdoors is the best place for body painting. But you will need to take precautions to avoid spillage even if you have a large garden. A patio next to a hosepipe is ideal, otherwise you may want to save large pieces of cardboard and let the kids roll around on those. 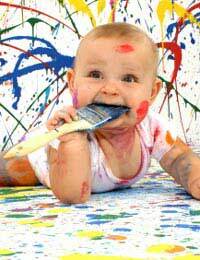 Keep paint away from children's eyes and other sensitive areas of the body. And be aware that some kids might appear enthusiastic about the thought of painting but be completely squeamish when it comes to actual participation. Don't rush your children and let them take their time. They can always just finger paint if they prefer. Large pieces of butcher paper or card are the best to make body paint art. If you have a small toddler or baby, try to get paper that is at least the size of their body for best effect. Older kids will no doubt appreciate paper as big as you can get it! It's easy to make your own body paint, if you prefer. Add two cups of baby shampoo, divide into several small portions and pour into airtight containers. Add a teaspoonful of bright tempura paint and mix, adding more until you achieve the desired colour. Repeat using different colours until you get the palette you want. You can even box up the paint and give away as a bright summertime gift – it will keep for a while as long as it is shaken properly before use. Small babies might object to getting too covered in paint, so making art involving only their hands and feet might be a simpler way for them to get involved with older siblings. Just dip them in paint, then press down on a strong piece of paper. You can make pretty designs or just have a keepsake of their tiny bodies. If you want to get all creative yourself, why not make greeting cards out of their hand or footprints? Use different colours and experiment for best result. Great present for grandparents as well – buy an inexpensive frame and you have their next birthday/anniversary/Christmas gift at little cost.